Zimbabwe's opposition says there has been a sharp escalation in violence against activists across the country. The Movement for Democratic Change (MDC) has accused the authorities of carrying out arbitrary arrests. MDC leader Morgan Tsvangirai also told a UK newspaper that President Robert Mugabe was now using "hit squads" to crack down on the group's members. Scores of activists were arrested and allegedly assaulted after police broke up a rally just over a week ago. Four senior MDC officials were prevented from leaving the country, some to seek treatment for injuries they say were sustained in police custody. The police accuse the MDC of starting the violence - which it strongly denies - and say the travel ban is necessary because some activists may face charges. On Monday, Zimbabwe's foreign minister warned foreign diplomats that the government would not hesitate to expel them from the country if they gave any support to opposition activists. Meanwhile in Brussels, a senior European Union politician said officials from Zimbabwe's ruling Zanu-PF party should be banned from attending planned meetings of EU and African, Caribbean and Pacific (ACP) officials later this week. "It is clear that the participation of Zanu-PF delegates in the ACP-EU meeting would send a terrible signal," said Glenys Kinnock, co-chair of the EU-ACP group. MDC spokesman, MP Nelson Chamisa, said he was severely beaten on Sunday as he tried to leave the country to travel to the meeting. But the Zanu-PF delegation has arrived in Belgium. A statement issued on behalf of Mr Tsvangirai says that groups of youths from Zanu-PF and officials of the Central Intelligence Organisation have been targeting known MDC activists. Those targeted have been taken into custody and assaulted, but none have been charged or brought to court, the statement says. It claims another 35 MDC members - on top of the 50 injured when police broke up the rally nine days ago - have been taken to hospital with fractures and severe bruising. 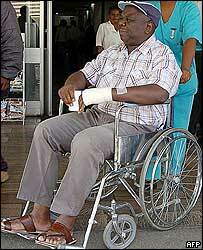 Mr Tsvangirai's spokesman William Bango told the BBC that six had gunshot wounds. The MDC argues this bears the hallmark of a deliberate attempt to crush all legitimate resistance to the government, the BBC's Southern Africa correspondent Peter Biles says. In an interview for the UK's Daily Telegraph, Mr Tsvangirai - who needed stitches in a head wound after he was arrested - said the authorities' crackdown on MDC members had become much more focused. "Instead of random beatings at police stations, [Mugabe] is now using hit squads, unidentified men, unidentified vehicles," he told the paper. "But we know there are units of state agents that have been given this assignment." He said the violence was "coming directly from Mugabe". But Security Minister Didymus Mutasa denied the allegations, saying they were "a flat lie". Mr Mugabe has said Western critics should "go hang". More than 80% of Zimbabweans are living in poverty, with chronic unemployment and inflation running at more than 1,700% - the highest in the world.